Skuggsja, the project featuring Enslaved’s Ivar Bjornson and Wardruna’s Einar Selvik, have streamed their self-titled debut album in full ahead of its official launch. 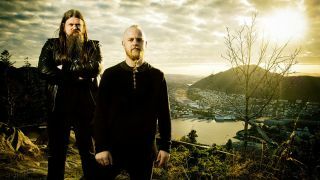 It’s set for release on March 11 via Season Of Mist – and Bjornson reports making the concept record with Selvik was an “amazing” experience. He says: “Turning the live piece Skuggsja into an album has been an amazing journey. I am privileged to have made it alongside Einar and the team that has helped us fulfil our common vision. Selvik adds: “There are many things I could say about the album and its diverse material, but in the end I think it is best to let the music speak for itself. Skuggsja is available for pre-order via Season Of Mist’s online store. Skuggsja will perform at the Metal Hammer and Prog-sponsored London By Norse 2016 on March 17-20.